Place the butter and chocolate in a heatproof bowl and melt over a pan of simmering water. Use the side of your knife to crush the black peppercorns. Whisk the eggs with an electric whisk. Once the eggs have doubled in volume, carefully fold in the melted chocolate, sugar and the sifted flour. Stir in the pepper. Butter and flour your brownie moulds and then add the brownie mixture. Transfer to the oven and cook for 10 to 12 minutes (take care not to overcook the brownies, they should be gooey in the middle when served). Mix together the cream, pistachio paste and agave syrup. Pass the mixture through a sieve and then pour into a siphon. Seal the siphon, charge with gas and then shake gently and keep chilled until ready to serve. 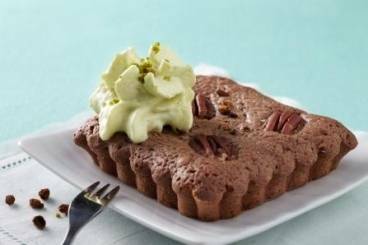 Serve the brownies with the pistachio chantilly.